Scientists at Tohoku University in Japan have teamed up with others to create a simple method to develop and functionalize virus-like polymer particles that have many nanostructures. The partnership includes scientists from Michigan University in the USA and Karlsruhe Institute of Technology (KIT) in Germany. The geometrical control of antibodies, enzymes, and other proteins over polymer particles is vital for achieving cascade reactions seen in a living body; very efficient drug delivery systems; and very sensitive immunoassay systems. Given enzymatic reactions take place step-by-step along aligned enzymes, the formations of such enzyme arrays are critical for realizing the particles. In drug delivery systems and immunoassay systems using polymer particles, the density and alignment of antibodies on the particles are very crucial factors in attaining high sensitivities. A virus is a perfect particle given its nanostructures and geometrically-controlled functional groups. But, structural control and selective chemical alteration of synthetic polymer particles have so far been inaccessible because of their complicated synthetic routes. Diblock copolymers develop nanoscale phase-separated structures, and macromolecular compositions can regulate structures and periodicities. 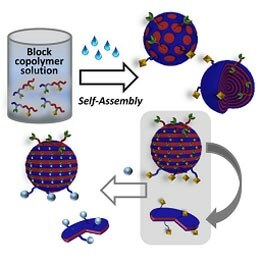 In the current study, Guillaume Delaittre and co-workers at KIT have been successful in synthesizing hydrophobic diblock copolymers that possess functionalized blocks. Divya Varadharajan at KIT and Hiroshi Yabu at Tohoku University have changed those diblock copolymers to nanostructured particles with the help of a nanoprecipitation technique they formulated. Altering the preparation conditions, morphologies, and sizes of particles resulted in core-shell, stacked lamellae, and other morphologies being found. The stacked lamellae structure, in which both polymer phases are exposed to the particle surfaces, was selected for selective chemical alteration. To envision the site-selective chemical alteration of particles, fluorescent dyes were fixed on the one polymer phase. Joerg Lahann at Michigan University identified this chemical alteration by monitoring ring-shaped fluorescence from nanodiscs originating from disassembling stacked lamellae. Lahann used stimulated emission depletion (STED) microscopy in his research, which is one of the super-resolving microscopy techniques.